This chart continued in one form or another up into the release of DnD 3rd edition when it was replaced with Fortitude, Reflex, and Will saves. I apologize for not rememberin= where I first read this, but it was pointed out that if you look at the original saving throw chart a pattern emerges. 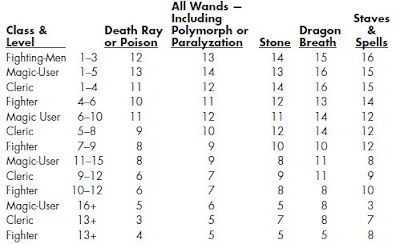 You will see see that for all classes save versus death ray/poison are clearly better than save versus staves/spells. It not unreasonable to suggest that given the severity of save or die that Gygax opted to give his player a significant (10% to 20%) break at lower levels. It appears that Flesh to Stone occupied a middle ground between the two. An effect that takes a character out of play but there is a way to restore them to full functionality (Stone to Flesh). That wands were considered an advantage compared to memorized spells and thus easier to save against And finally that a dragon's breath was more easily resisted by a fighter than a magic-user/cleric. Looking at the original saving throws categories this way lead to a straightforward procedure on determining what category to use. Unless it is something more easily resisted by a fighter than a cleric or magic user then use Dragon Breath. Unless it is a Save or Die effect or something similar then use Desth Ray/Poison. If it is a incapacitating effect that is reversible then use Stone. If it anything but a Save or Die effect and it comes from a wand use the All Wands save. I still prefer Swords and Wizardry single save with specific bonuses but I appreciate the original saving throw system better now that I took another look. The system is great but it gets wonky at higher levels. I like to use the first appropriate, reading top to bottom. Also: saves are to avoid a bad thing; skill checks are to achieve a good thing. I prefer the original five saving throws for two reasons. They help differentiate between the classes and they are not influenced by attribute scores.